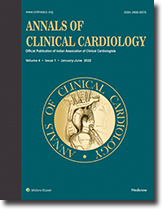 Annals of Clinical Cardiology, a publication of Indian Association of Clinical Cardiologists, is a peer-reviewed print + online Semiannual journal. The journal's full text is available online at: http://www.onlineacc.org. The journal allows free access (Open Access) to its contents and permits authors to self-archive final accepted version of the articles on any OAI-compliant institutional / subject-based repository. Annals of Clinical Cardiology is the official journal of the Indian Association of Clinical Cardiologists. Journal designed for cardiologists, cardiac surgeons, physicians, general practitioners and internists with a subspecialty in cardiology throughout the world. ACCJ publishes original peer-reviewed clinical and research based articles on all aspects of cardiology and cardiovascular surgery. Journal mainly focuses on acute coronary syndrome, heart failure, valvular heart disease, cardiomyopathies, imaging in cardiology, congenital heart diseases, cardio-vascular surgery, sports cardiology, cardiac pharmacology, newer diagnostic modalities, cardio-oncology, preventive cardiology and large single center or multicenter studies. Conference related abstracts, mini reviews, clinical reviews, editorial write-up, and letter to the editor. ACCJ also publishes abstracts of papers presented at the annual scientific sessions of the Indian Association of Clinical Cardiologists IACCCON. Annals of Clinical Cardiology, a publication of Indian Association of Clinical Cardiologists, is a peer-reviewed print + online Semiannual journal. Online since 8th December 2017.